What particularly struck Mr. Scatter this time around was the splendid balances of Mozart’s music for this opera. It’s not the almost mathematical balances of Bach, which have their own charms, but a more dynamic balance — a matching of voices and vocal weight that encourages (indeed, practically demands) an ensemble approach to the singing. It’s not that there aren’t some stunning solo moments: Figaro has some arias that can hold an auditorium in suspended time. But in this opera stunning vocal gymnastics are less important than the interweaving of voices and characters, and that could be the key to why Portland Opera’s production is so pleasing: everything works together. Three things mark the singing in this Figaro: precision in tone and attack (everyone’s emphatically in tune); an evenness of projection and tonality; and vocal warmth. Jennifer Aylmer’s Susanna (the bride) and Pamela Armstrong’s Countess Almaviva are well enough matched physically to make the bed-switch aspects of the plot plausible, and their voices are complementary, Aylmer’s a little brighter, Armstrong’s a little more colored. Jennifer Holloway is so lightly adept as Cherubino that she seems to put on her pants role both legs at a time. David Pittsinger has the sort of matinee-idol carriage that brings Count Almaviva’s little corruptions of conceit to life. And Daniel Mobbs, as Figaro, deftly balances the odd requirement that his character be the center of the comedy and also step aside so the women can slip into the drivers’ seat. Kudos to stage director Stephen Lawless, who keeps all these balances sharp and lively, and to conductor Ari Pelto, who keeps the orchestra precise and urgent while providing a little showmanship of his own as he bobs and jabs from the podium. His approach might be a little showy. But after all, isn’t this a show? 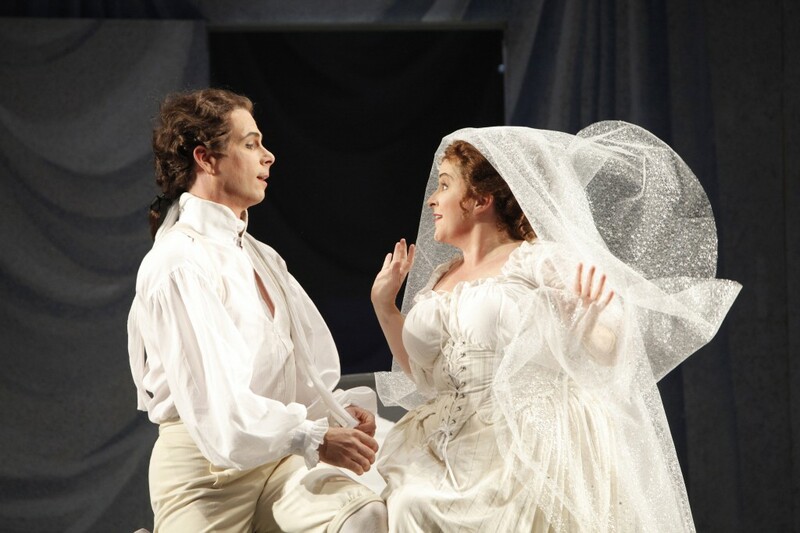 PHOTO: Daniel Mobbs as Figaro and Jennifer Aylmer as Susanna. Â©Portland Opera/Cory Weaver.